Davis has 1st round pick potential in my opinion, but you never hear anyone talk about him! Do you know who Knile Davis is? If not, you are missing out. 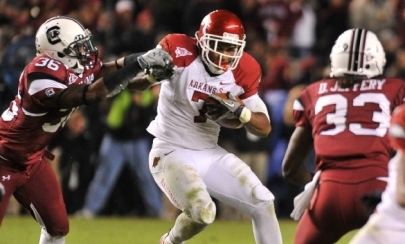 He is the starting running back on Arkansas’ offense and after watching a number of Arkansas games this season I am totally convinced that he is the best NFL prospect on that offense and potentially on that team. The funny thing is not many people know who he is, and he isn’t even eligible for the draft yet! He is a true sophomore and is young having just turned 18 this year, but he does not run like a normal 18 year old running back. He has impressive size at 6’0″, 220 pounds and he has a listed 4.49 time. He has been incredibly productive since getting the starting nod after their original starter, Dennis Johnson, was injured in their second game of the season. He got the starting nod after week four and has absolutely taken off since then. He hasn’t had a game with less than 82 yards, he has five 100+ yard games since he has taken over including four 150+ yard performances. He has a total of 1,183 yards, 13 touchdowns and a 6.6 ypc average. He also has 16 receptions, 128 yards and a touchdown. In his last six games he has 12 touchdowns… that is absolutely insane production, and it has made life a lot easier for Mallett off of play action. Now, some of you are probably pretty skeptical about Knile Davis, a guy who hasn’t even completed his first season as a starter (with only nine games under his belt after the bowl game), being a better NFL prospect than Ryan Mallett or anyone else on Arkansas. But I am convinced that he is. I think Mallett is overrated as a NFL prospect and even though he will probably get drafted in the 1st round when it is all said and done I think that his accuracy is too spotty, his footwork is too inconsistent, he makes too many bad decisions and forces too many throws into coverage to ever transition appropriately to the NFL. That, and Bobby Petrino’s offense doesn’t exactly prepare a QB for the NFL (see Brian Brohm). Now that I have explained why I am not a fan of Mallett I should explain why I am a fan of Knile Davis. As I mentioned earlier, he has good size for a RB, quality speed and he has been really productive. The question is why he has been productive. I noticed in all three games that I watched that more than anything he runs hard and drives his legs after contact is made. He is definitely not afraid to lower his shoulder and hit someone if it means gaining more yards, and he runs through arm tackles with ease. You can’t arm tackle this guy, you need to form tackle him or gang tackle him. Not only that, he seems to have good vision and does a good job finding cutback lanes and seams that his offensive line create for him. In addition, he has shown me an impressive burst to hit the hole or bounce a run outside and he has good enough acceleration and speed to get the edge. He hasn’t had a lot of opportunities to prove himself as a receiver, but he has looked like a pretty solid pass catcher in the limited number of chances he has had. I don’t think he has a lot of experience pass blocking either, but that will come with time and can easily be coached up at the next level. So, let’s recap: Size? Check. Speed? Check. Burst? Check. Vision? Check in my opinion. Power? Check! Production? CHECK! Potential? Definitely a check. That’s not an overly in-depth scouting report, but then again he is only a sophomore and he has a lot of time to improve and show everyone his ability. But in my opinion he has 1st round draft pick written all over him. Maybe not a top 15 pick, but definitely a 1st round pick. I am excited to watch him in the bowl game and even more excited to see him take over as the feature back next year with a new QB in place to see how he does as the main focus of the defense. I think that with all of the returning talent that Tyler Wilson has he should have an easy enough time passing if the defense tries to take away Davis in the running game. For those of you who don’t know, Wilson is Mallett’s back-up who actually completed 73.5% of his passes agaianst Auburn after Mallett got hurt while throwing for 332 yards, 4 touchdowns and two interceptions. That really says a lot about the system that Arkansas has in place for QB’s to be successful in, but I will leave those thoughts for my Ryan Mallett scouting report. Thanks for reading, and enjoy Knile Davis’ performance in the bowl game against Ohio State!